We’re big fans of TPO roofing, but only when it’s the right choice for our customers. Your commercial building might benefit from a new TPO roof. If you’re wondering, give us a call and we’ll give you the scoop. 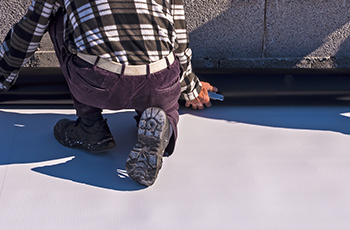 Recently, it has become one of the most popular materials for flat roofs, on both office buildings and industrial facilities. It is being used on sports arenas and medical facilities. It can be a good choice for just about any application. TPO membranes are not all the same. Some membranes are thinner than others, sizes are different, and specifications vary widely depending on which manufacturer your TPO is sourced from. it is important that you’re working with a local commercial roofing contractor that knows the differences, is going to be honest with you about what the best choice is for you, and has the experience to do the job right. That commercial roofer is Golden West Exteriors. There are also several different methods for installing TPO roofing. We’ll choose the best one for your roof. A roofer who doesn’t walk you through the options and explain why their installation method is the best may not have the experience you’re looking for. While TPO roofing is available in a couple of different colors, white has recently become very popular. The theory behind the popularity of TPO white membranes is that they reflect the sun’s harsh rays and help keep your building cooler. That can save you or your tenants a lot of energy, and a lot of money. It is also 100 percent recyclable and environmentally friendly. If you’re thinking about applying for LEED certification for your building, white TPO roofing may help get you a few extra points. If you are considering TPO roofing, give us a call. We serve all of Alberta and have a long line of happy commercial customers behind us who are happy to tell you about their experience with Golden West Exteriors. We demand the best from ourselves, and we expect our customers to do the same. From craftsmanship to customer service, you should demand the best from your commercial roofing contractor, and they should demand the best from their partners and the manufacturers they work with. We use only the highest-quality materials from manufacturers we trust, and who stand by their work just like we do.